Zhouzhuang is the most popular water town, due to its rich culture and unrivaled water town views. Your culture-savvy tour guide will give you a brief introduction to Zhouzhuang during the drive from Shanghai to the town. Let&apos;s start today&apos;s tour with Zhouzhuang Museum, the best place for forming first impressions of the town. When it was built in 1912, the building now housing the museum was the private residence of a rich man, whose family name was Zhu. The decorations and furniture in the museum reflect Zhu&apos;s ideology and background. He abandoned his residence during wartime, but fortunately it did not suffer total destruction. Now, besides the interior decoration and furniture, some precious photos, paintings, and old agricultural tools are also part of the museum collection. The Mi Pavilion was the favorite place for local poets and writers to share their views of literature and life. You may yourself want to compose a poem on seeing the postcard-worthy water town view from the pavilion. You can soak up the atmosphere of Zhouzhuang during the 1920s by walking past the tea houses, craft shops, iron shops, traditional Chinese medicine stores, and weavers’ houses on Zhenfeng Street. After a short walk on Zhenfeng Street, you may feel a bit hungry. Your tour guide will help you find a local restaurant where you can try out the most authentic local food. The Shide and Yongan Bridges are connected by a short stone path, so local people call them the Twin Bridges. They look like two ancient keys and local people believe they are the keys to success, praying for success as they walk by. The Twin Houses belonged to Zhang and Shen, who were two rich merchants whose luxury lives in the past are now reflected by the decorations and antiques in their two homes. Whenever you visit this garden, you can enjoy views of spring, summer, autumn and winter. The Buddhist temple in the winter section offers you a good vantage point over a lake covering an area of 0.66 square kilometers. You can also learn some Buddhist culture in the temple. Shen Wansan (1330–1376 AD) was the richest merchant in China during the Ming Dynasty (1368–1644 AD). It is said his fortune at the time would have been equivalent to 2,000 billion US dollars nowadays. The statues and paintings in Shen&apos;s former residence tell you the story of his personal life and business. He donated enormous sums of money to government in order to build the Great Wall, which has become the most renowned tourist attraction in China today. 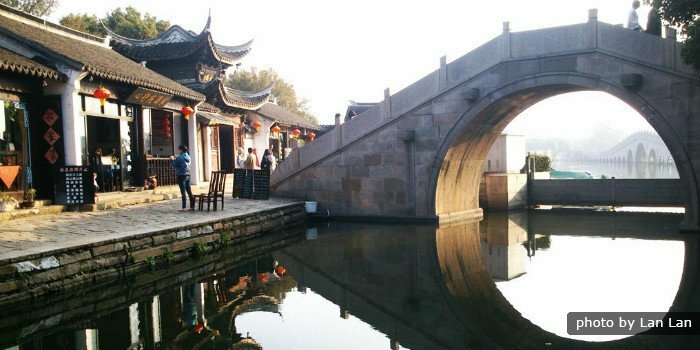 You will take a boat along the canal via which Shen Wansan entered and left Zhouzhuang, as far as the exit of the Zhouzhuang Water Town area. After the tour, you will be transferred back to your hotel in Shanghai.